While spring and summer bring a beautiful, lush canopy, growing leaves and trees can also showcase some of the issues a tree is having. Here are some common tree issues and how you can best solve them. If you’re really worried about a tree (especially if you think it may endanger your house or property) please reach out to a professional certified arborist. For trees in the first three years, one good, slow soak (~25 gallons) once a week is all that is required. Afterwards, trees really only need supplemental water in times of drought. Excess water decreases the oxygen available in the soil and provides a good environment for some root-rot fungi. 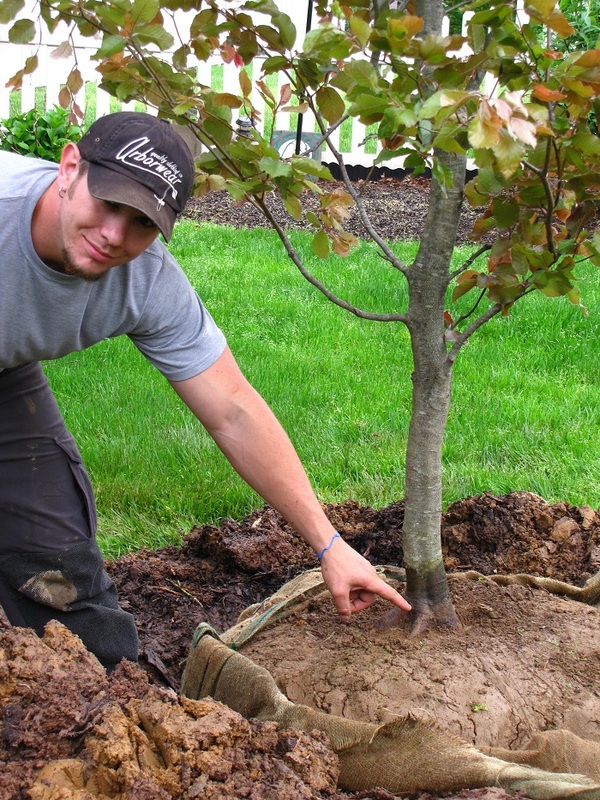 How to know if your tree is overwatered? The area around the tree is constantly wet, new growth withers before it’s fully grown or becomes light green or yellow, and leaves appear green but are fragile and break easily. Though, underwatering is a problem too! While we had recent rain, that may not be enough for your trees. If they aren’t getting enough water you’ll see wilted or curling leaves that may turn brown at the tips or edge, a sparse canopy of off-color and undersized leaves, leaf scorch or yellowing leaves, and untimely fall color and early leaf drop. Sign up for our Watering Alerts so you know when to water. I can’t see the trunk flare at the base of the tree, which makes me suspect that the mulch is too deep here. No mulch should be touching the trunk at all – it ought to be pulled back several inches away – and the trunk flare should be clearly visible above grade, just like this. Remember the 3-3-3 rule: 3 inches of mulch in a 3-foot ring with a 3-inch space around the tree trunk. Things like herbicide or excessive fertilizer applied to turf can damage trees, and watering regimens designed for turfgrass can be too frequent for trees. Cedar-apple rust is a fascinating fungal pathogen that affects junipers and trees in the rose family like apples, hawthorns and serviceberries. It’s ugly and makes the infected fruit inedible, but thankfully not damaging to the tree. Any plant infested with large numbers of sucking insects, like aphids, may be affected by sooty mold. Sooty mold fungus is a general term for several species of fungi or molds that use the honeydew secreted by sucking insects as food to develop and grow. While it generally does not cause damage to the plant, but can be a considerable nuisance to homeowners as it affects anything beneath the trees including hardscape, cars and structures. Remedies include spraying visible aphids or scale insects with a mix of castile soap and water, placing a sticky barrier around the base of the trunk to prevent ant movement, and washing the mold off with a hose (do this in the morning so it can dry out over the course of the day).